Catching fish is hard enough as it is. Finding them can be even harder. Make life easy on yourself, won’t you? Get yourself one of these nifty fish detection devices and you’ll be fishing where the fishies hang out. If you are looking for a portable, affordable, and easy to setup fish finder, then the iBobber is an incredible choice. This one is compatible with Apple as well as Android devices. Therefore, you won’t be restricted on a particular platform. It provides you with information concerning the location of the fish, the depth, as well as water temperature. Most people fear using Bluetooth enabled devices, since they tend to drain batteries. However, with the iBobber, you don’t have to worry about such issues. It uses a Bluetooth connection that consumes much less power as compared to normal Bluetooth connections. This means that your battery will last much longer during the entire duration of your fishing trip. Portability is another great feature that you get when you purchase the iBobber Wireless Bluetooth. It is small and compact making it easy to fit into any backpack, rucksack and even a pocket for easy transportation. It is also light, weighing less than 2 ounces. In fact, it looks like a bobber. Featuring a 118 kHz transducer, this one can scan water depths of up to 135 feet. It can also communicate with your smartphone from as far as 100 feet. This ensures that you get the best and most accurate results. If you consider how small this device is, this is quite impressive. Once this device detects fish, it marks it based on its size. Fish are mainly divided into 2 distinct categories, those below 15 inches, and those above 15 inches in length. This is a reliable device, which provides high quality services. As long as you own a smartphone and you have this device, catching that big bass should no longer be a problem. The Lowrance HDS Live Fish Finder is designed to make your fishing trips fun and enjoyable. Its key features include smartphone integration, live charting as well as real-time sonar. The Active Imaging Sonar enables you to see cover and structure clearly. This technology combines SideScan and DownScan imaging with Lowrance CHIRP, thus allowing you to quickly search areas where you think the fish might be hiding. Besides that, it’s compatible with a traditional sonar transducer. As long as you have used a transducer before, then this device one should not give you any problems. You can even use it without changing any frequency, and it will always deliver reliable results. And if you want to explore depths of more than 120 feet deep, then you simply need to adjust the frequency. This fish finder for small lakes features LiveSight Sonar, which makes it simple to view any fish within your radius. Whether the fish are resting or swimming, you can clearly see where they are at all times. Also, this feature enables you to see how the fish are reacting to your lures. Therefore, you can change the lures anytime, if you feel they are not effective. It’s perfect for lure-tracking, vertical-jigging or drop-shotting. As noted above, the Lowrance HDS Live Fish Finder is equipped with Genesis Live Charting technology, which delivers real-time mapping capabilities. With this feature, you can control contour density and transparency. Apart from that, you can easily draw and save the charts into an external SD card for later reference. It’s also compatible with your smartphone, which means that you can access the information on the device through your smartphone. Fishing is fun and you can spend quality time with family and friends engaging in this awesome activity. However, to make it even more captivating, you need a remarkable fish finder, such as the Lowrance Elite 3x. This is an excellent device, which comes in a compact and affordable package. As you might already know, a color display produces better color quality and clarity. However, most finder devices with colored display, tend to be quite expensive. 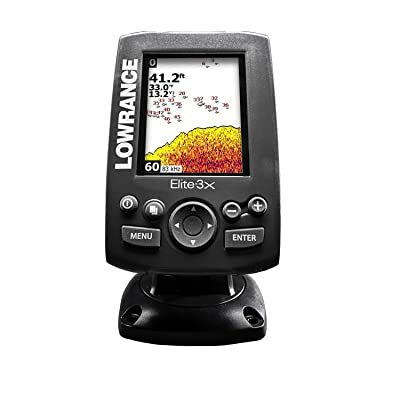 The good news is that Lowrance Elite 3x features an extremely affordable price. It is perfect for both beginners and experienced fishermen, due to its easy to navigate menu. With the added benefit of a large and bright color screen, together with two frequencies to map a larger area, you no longer have to worry about going home without fish for your dinner. The full-color display screen is easy to read even during bright sunny days. The sensitivity on this device is 10 times more than what is commonly found in other models. It also comes with broadband sonar, which is very effective in extending the transducer’s battery life. As noted earlier, it gives you the benefit of using two fishing frequencies. For locating larger schools of fish, use the 83 kHz frequency. On the other hand, the 200 kHz allows you to target and separate the areas thus increasing your ability to locate and catch more fish. Its compactness is a huge benefit for anglers with smaller vessels and faced with space limitation. Additionally, it is easy to use while the mounting equipment simplifies the entire installation process. Do you see anglers on TV holding a big sturgeon and you wonder how they managed such a catch? Well, you can also join this elite club. Look, you don’t have to come from a fishing family to achieve that. All you need is a device that helps you identify potential fishing spots. You can do this using the Garmin echo 150 Dual-Beam Fishfinder. The Garmin echo 150 is a dual-frequency, dual-beam, and portable fish finder, manufactured by one of the most trusted brands when it comes to outdoor gear. Since it is portable, this finder is suitable for fishing kayaks, canoes as well as other smaller fishing vessels. It is also perfect for those who move between a lot of boats, in the course of their fishing expeditions. Apart from measuring water depths, it also displays a high-resolution image of structural elements such as rocks and weeds lying beneath the water. It helps you track fish targets within a wider zone, making the job much easier, for both seasoned anglers and beginners. It delivers a power-packed, and cost-effective performance with the help of Autogain technology to minimize clutter and maximize targets. The suction cup mount design is just perfect for ice-water fishing. With that design, the transducer can float horizontally both in shallow and deep water. When it cannot produce a color display, it still tracks fish while giving accurate water depth, two important features when fishing. You don’t even have to keep it dry on board your ship or boat, since it is already fitted with water-resistant features. If you love fishing, whether as a sport, or as a main occupation, you will definitely love the ease of use, the stability and the remarkable results produced by this incredible fish locator device. Deeper has taken the world of sonar fish finders to a completely new level with their world-class smartphone fish locators. The Deeper PRO+ is compatible with both tablets and smartphones using Android 4.0 and above and iOS 8.0 or later. One of the best features in this model is that it allows the finder’s GPS to establish bathymetric maps, whether you are onshore or offshore. If you don’t know what that is, a bathymetric map is the equivalent of a topographic map. The bathymetric map is however submerged in water. These maps are designed to provide measurable and accurate descriptions, together with a visual presentation of the underwater terrain. In short, you can now explore your favorite lake, then determine the details and contours, which will make your next fishing trip a total success. Instead of using Bluetooth, this one uses Wi-Fi connectivity. You don’t need to be a tech-savvy to know that Wi-Fi connectivity is more reliable than Bluetooth. In today’s digital world, it is always advisable to have a wireless connection even when you are out there fishing. Someone might just need to reach you anytime. Apart from that, you can send pictures of that paddlefish you just caught to your family, just to keep them salivating! It has a battery life of around 6 hours. The good news is that it charges in less than 2 hours, which can even be done on your fishing boat. Imagine charging from zero charge to full battery in less than two hours. How cool is that? The Wi-Fi connects directly to your cell phone, meaning you don’t need to rely on your data when fishing. Just leave your other Wi-Fi devices at home and enjoy your fishing trip. Deep lakes without visible cover can be very challenging to fish especially without electronics. However, with the Garmin Striker 4, you have everything you need to bring home that striped bass that your child has only seen in movies. This is not your ordinary sonar unit. It comes with some of the most advanced features, in fish finder technology. The use of CHIRP technology is definitely ground breaking. What sets this baby apart from the rest? Enclosed in a strong plastic housing, the Garmin Striker 4 also has a sealed rechargeable battery, together with a charger. Also included in the package is a suction cup for mounting on smaller vessels. Therefore, if you kayak or canoe fishing is your thing, your needs have been taken care of. With a water tolerance of around 1 meter deep for 30 minutes, you are able to scan water higher water depths. Unlike other models, this one can be used on both fresh and saltwater. For freshwater scanning, it can attain depths of up to 1600 ft. If you are using it on saltwater, you can attain depths of up to 750 ft. With such power, you can identify and map out even the most remote waters. The use of CHIRP (Compressed High Intensity Radar Pulse) technology adds some remarkable power as well as clarity to the images provided by this device. In short, you will benefit from better defined targets, clearer images and as well as less clutter. If you are looking for an affordable, small and powerful fish locator with CHIRP technology, the Garmin Striker 4 is the one for you. The Venterior Portable is one of the best portable fish finders for kayaks and small boats. If you are tired of sitting in your boat for long hours with nothing to show for your efforts, then you should consider this device. This portable wired device comes with highly powerful sensor. It enables you to discover large shoals of fish effortlessly and fast. This one also contains a power saving feature, which turns it off whenever it’s not in use. It works by displaying the approximate distance and location where the fish are in large numbers. Apart from identifying the location of fish, it also gives you the ability to view natural elements in the bottom of the water like stones, weeds and grasses, as well as the complete contour. This fish detector also gives an estimate of the depth of water. Unlike other devices, the screen on this device is backlit. This can create all the difference for the angler who loves fishing both day and night. Thanks to its generous operating temperatures, you can also use it for ice fishing. It is compact and easy to handle making it a breeze for novices to locate their catch. This portable fish locator produces a beam angle of approximately 45 degrees, enabling you to find large submerged structures, together with fish. This feature also allows you to zero in your targets, so that you can capture fish more easily. With its audible fish alarm, you can easily identify the location of the fish. If you are looking for an efficient, compact, and accurate fish finder, in both shallow and deep waters, then you should check out the Garmin Striker 4. Thanks to this device, you will spend less time looking for fish and more time catching them, thanks to its exceptional levels of accuracy. It offers uninterrupted and smooth footage when you are moving between shallow and deep waters. Its design is captivating. And if you are fishing with a smaller boat, then you will love its portable design. You will also notice that its buttons are clearly marked, thus making your work easy when it comes to operating it. Even if you are wearing gloves, you will not struggle with the buttons. Featuring a waterproof rating of IPX7, the Garmin Striker 4 is a perfect fish finder for kayak fishing and canoes. It can withstand a water depth of 1 meter, for up to 30 minutes. However, it’s not advisable to use this device for high-speed water sports. It’s also equipped with a GPS, which you can use to find your way around your fishing spot. Just like its name suggests, this device is equipped with a CHIRP sonar transducer, which makes it easy to find plenty of fish, wherever they might be hiding. The Garmin Striker 4 is arguably one of the best fish finders for bass fishing. Its performance is outstanding. Apart from that, it’s exceptionally versatile, which means that you can use it whether you are fishing in salt or fresh water. Some of its modes include the Traditional Mode, Flasher Mode, Split Frequency, Waypoint Map, and the Sonar Screen. The Traditional Mode mainly shows the bottom structure of the river or lake while the Flasher Mode indicates the depth level. The image quality is clear, making it easy to tell the difference between the fish and other obstacles. The Garmin Striker 4 is a user-friendly and efficient fish finder, which you can use across different fishing locations. The Humminbird 410210-1 Helix 5 is a versatile fish finder, which you can use for winter fishing, trolling with your kayak as well as onshore fishing. It’s also one of the most powerful fishfinders on the market today. Unlike previous iterations, the Gen 2 is equipped with CHIRP sonar technology, which can scan water up to a depth of 1,000 feet. It can achieve this using high, medium or low-frequency modes. 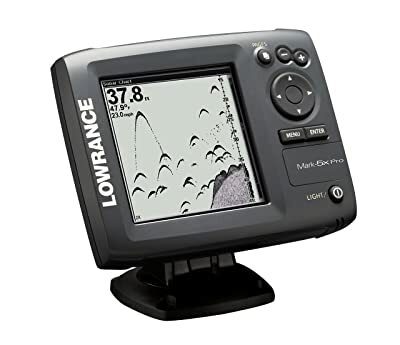 Apart from that, this fish finder for deep waters features a high-resolution display, reduced image noise as well as greater target separation. Also, it features a waterproof rating of IPX7, meaning it will continue operating optimally, even when fully immersed in water. Its design is robust, magnificent and sleek. The outer case is waterproof and sturdy. In terms of performance, this device will meet and exceed your expectations. It’s one of the best fish finders with down and side imaging. The side imaging display helps you to see underwater structures, including intertwined tree branches while the down imaging mode gives you a clear view of the water depth. Using this information, it’s easy to determine the right spots for fishing. It comes with an ultra HD, 5-inch display, which makes it easy to see everything displayed on the screen. You can use it both indoors and outdoors, thanks to the remarkable clarity of the screen. It also comes with a fish alarm, which goes off whenever it detects the presence of small, medium or large fish. And you can customize the alarm according to your preferences. And with the help of the sonar recording feature, you don’t need to scan the same spot twice, since that information is readily stored in the micro SD card. Having the ability to navigate your way quickly around murky fishing waters, is always a bonus. If you have the best tools for the job, you can easily do this and still enjoy your fishing trip. If you are a serious angler, then the Lowrance Mark-5x Pro is the device for the job. The device is so concise, accurate, and easy to use. Whichever the reason, anglers all over the world are speaking highly of this really great fish locator. What makes the Lowrance Mark-5x Pro so special? Apart from the basic features, this one comes with a list of advanced features, which will instantly turn you into a professional angler. To start with, the LED screen is bright and crisp. On top of that, the keypad is backlit, meaning that you can use the device regardless of the natural lighting conditions. Also included is a transducer that you can easily mount on your fishing boat whichever way you prefer. This fish locator for kayak fishing isn’t damaged easily by water. With a screen of 5 inches, you don’t have to use a magnifying glass to read the details on the screen. The size is generous enough to give you all the amazing details on the screen. When you are on a fishing trip, it can be totally frustrating trying to figure out how to install a device like this. However, that is not the case with this one. If you are looking for a good one that will make your fishing so much easy, the Lowrance Mark-5x Pro is just what you need. The Hummingbird Helix series features compact, affordable fish finders that come with all the features of the more expensive, larger models. In particular, the HELIX 5 DI comes fully loaded with various features to ensure that you bring home the striped bass on your first fishing trip. Whether you are a seasoned or an amateur angler, this one meets your needs perfectly. One of the main reasons why this one is popular with anglers is the in-built GPS feature. You can explore as much as you want during your fishing trip without fear of getting lost in the waters, thanks to this GPS feature. Additionally, the internal GPS chartplotting combined with built-in UniMap cartography allows you to go wherever your boat might take you. Also included in this model is a microSD card, which you can use to load extra maps should the need arise. Considering how affordable this fish finder is, you can be tempted to think that the display is not impressive. Well, that is not true. This model features a brilliant screen, measuring five inches. It provides you with all the features and benefits of a of a well-developed 256-color display. Most people prefer fishing early in the morning and late in the evening. Regardless of what time you intend to go fishing, your ability to view readings on the display is not affected, since the screen is backlit. If you consider the number of features versus the cost, you will realize that this one provides value for money. Returning home empty after an entire weekend of fishing can be very frustrating. However, you don’t have to spend sleepless nights out in the cold trying to play hide and seek with the blue cat fish. The secret is using a fish finder, and in particular, the Venterior Portable and you will always be a happy fisherman. This finder for rivers, oceans and lakes can help you identify the precise fish location, as well as the depth of water. On top of that, if you adjust the sensitivity settings, you can even see the size of the fish. This prevents wastage of time and effort, catching small fish and having to return them in water. Apart from detecting fish location and water depth, it can also determine water temperatures as well as sand, weeds and rock on the seabed. It has a water depth of 1 M all the way to 100 meters. You need to note that the water depth is measured from the sensor. As for the settings, it comes with 5 user selectable sensitivity, backlight mode, battery save mode, unit of measure and fish alarm. Due to its compactness, you can carry it wherever you want to go fishing. If you have been randomly trying to throw your line and hope for a bite, your problems are long gone. All you have to do is paddle around, use your device to spot large schools of fish, cast your line and then reel them in. This fish finder for your phone is a mix between a fixed and portable gadget. It is a remarkable choice for kayaks and smaller boats. The Vexilar SP200 is a basic transducer, featuring a small wireless module, which connects to your smartphone through an app. The app is available for both iOS and Android. With this device, you can see the temperature data and depth at the palm of your hand. However, the finder must remain connected to a 12 V power supply. Therefore, if you are using a kayak, you will have to find a means of fitting a power supply, to keep your device operational. This one has a frequency of 200 kHz. It allows you to see depths of up to 240 fee in fresh water. This is more than enough for most anglers. The transducer itself is highly accurate. You can see the lure descending into water, moving up and down and even see the fish coming up to get the lure. Isn’t that awesome? Considering the amount you are spending, this one is quite a bargain. Apart from providing all the features available in other transducers, the display is not limited to screen size. You can use any phone or tablet that you prefer, with any screen size that you prefer. Whether it is a small 4-inch Samsung or a large 10-inch iPad, the choice is all yours. The 7″ Color LCD 600tvl is one of the latest and among the best fish finders in 2019. It is a fashionable, good looking and reliable underwater camera system. Apart from its large and colored screen, it also comes with a HD camera capable of producing 1000 TV lines. Various other devices on the market have tried to imitate this model. However, there are certain features that make it stand out. To start with, the fish model, water proof design together with the sturdy material on the cover make it highly durable and resilient. The cables are pull-resistant, waterproof and cold-resistant. Its battery lasts the entire day, giving you more fishing time. It is also rechargeable, if you happen to have a power source on your fishing boat. The pictures are almost as clear as your smart TV. Quite literally! The brightness of the camera lights does not affect presence of the fish. In fact, some will come as close as possible to the camera. If you are planning to go ice-fishing, then you need to carry with you this fish TV. The entire package is compact and nice, easy to carry and easy to use. The brightness of the LEDs is adjustable, meaning that you can use it in different levels of light. It is a fact that fishing can be a challenging task, especially if you are still new. However, leaps in technology such as the Lucky FFW-718 Wireless Portable Sonar fish finder, have made the whole thing easy and fun. This one is engineered with a wide range of great features to enhance your entire fishing experience. The outer casing material is waterproof and versatile. You can therefore use it in salty, icy or fresh water conditions. Fitted with a wireless sensor with a wireless operational range of approximately 100 meters, it is one of the most efficient ones. This finder for your fishing line instantly reveals shoals of fish as well as other fishing targets. It is ready to use, easy to set up and has a memory feature that records your settings preferences. The screen has a clear and seamless display. It is also easy to read during both day and night thanks to its excellent backlighting. Every angler wants a portable fish locator, which will offer peace of mind. With that in mind, this one comes with a robust wireless sensor. The battery life is just from another world. Forget the 10 hours you are used to. This one has a reliable battery life of around 500 hours before you can drain it. Imagine the tones of fish you can haul during such a period. The designated handheld unit uses 4 AAA batteries that can be replaced. The sensor is also designed with smart capabilities. Therefore, it automatically shuts down when not in use. You can use it in different ways. You can use either a boat or a roach line. This kayak fish finder manages to combine accuracy, affordability and efficiency. The Humminbird HELIX 5 SI is premium fish finder that comes with brilliant features to enhance your overall fishing experience. It comes with an extra wide 480 x 800 resolution displayed on a 5-inch screen. The screen also has backlighting, which ensures a crisp and clear image, in different lighting conditions, both day and night. This enhanced display is one of the features that sets this one apart from the competition. Unlike its predecessors, the GPS of this device is improved and enhanced, to provide precise and accurate readings. Apart from chart-plotting, it is also preloaded with UniMap cartography. It also comes with a micro SD slot that can be used for additional map software. Also included in the device is a micro SD slot, which can also be used for saving waypoints. All charts are displayed in a color and detailed topography. It can store up to 45 specific routes or 2,500 waypoints. This unit is also compatible with HotMap, LakeMaster, AuoChart Pro, AutoChart, and Navionics Gold. This versatility is guaranteed to give you flexibility, when identifying potential fishing locations and targets. You can also pick the program you want to use with your device. It features 3 distinct sonar models, allowing you to view depths that suit your needs. It is user-friendly, easy to use and comes with a couple of features to target what you want. The Humminbird 409610-1 is part of the Helix series, known for advanced technology, remarkable visual presentations and impressive readings. With a resolution of 800 x 480-pixels and a screen display of 5-inch 256-color Color TFT, you get optimal picture quality as well as exceptionally accurate readings from beneath the water. Humminbird is renowned for making affordable and quality fish finders, and they hardly disappoint. This is one of the few devices on the market with integrated GPS for such an affordable price. It features Dual Beam Plus sonar technology, which allows you to distinguish between fish, rocks, terrain, bait and other material. You might be asking yourself why a GPS feature would be so important. First, with this device, you can identify and mark individual fishing spots, which you can map out and return later. Apart from that, if you go fishing in unfamiliar waters, it is easy to get lost. However, with a GPS device, satellites are constantly monitoring your location, meaning it’s hard to get lost. Another great feature is the split screen, which allows you to do multiple things simultaneously. For example, you can zone in on a location on one side of the screen while viewing the original view on the other side. It also includes Chart plotting. Due to its helpful navigational aspects, many fishermen and anglers depend on its fish finding capabilities. The Hook-3X is an entry-level fish finder from the Lowrance brand. It gives you the ability to switch between different frequencies and mark fish or structures over large fishing waters. It comes with a 3-inch color display complete with LED backlight to provide easy data reading. With a detailed resolution of 320 x 240, you can read data even when the devices is exposed to direct sunlight. Its broadband sounder detail allows you to determine bottom hardness, resolve targets and map out the fishing ground bottom. Thanks to its Advanced Signal Processing, you don’t have to adjust the finder manually. With its simple mounting system, you can use this device even when you are an amateur. It is perfect for kayaks, float tubes and other smaller fishing vessels. Its reliance on dual frequency ensures that you get clarity in vision. Another great aspect of this unit, is its ease of use. You can simply control the entire device and access the menu items, using the easily accessible buttons. From the menu item, you can access items like ping speed, frequency and sonar speed. The biggest benefit of this unit is its lightweight and portable structure. It is also affordable, making it suitable for beginners. Fishing does not have to be a trial and error affair anymore, thanks to the Deeper Smart Sonar PRO Series. It is easy to use and deploy. This ultra-light and small fish finder can be cast using even the standard fishing lines. One of its best features is the Boat Mode. With this mode, you can mark the locations of fish directly on your offline map, and then display the information on your smartphone. This feature relies on the GPS on your smartphone, to set your actual location. With this device, you can access and archive the maps any time, which improves your overall fishing efficiency. Designed with advanced sensor technology, you can easily separate objects even as close as 1.3 cm to each other. It can also identify even small underwater objects. Moreover, its 8 times extended dynamic range allows a more accurate detection of various objects. All this is done to offer you with precise underwater readings and images. The Deeper Smart Sonar PRO is boosted with double scanning frequency, producing up to 15 scans per second. This allows the device to capture underwater objects faster, including those moving at high speeds. This means that you can track all the fish passing beneath the radar. It is suitable for all types of fishing, ranging from shore fishing, kayak fishing, ice fishing and boat fishing. This is another great product from Humminbird, which comes with many features to enhance your fishing trip. Display plays a crucial role in all finding devices. 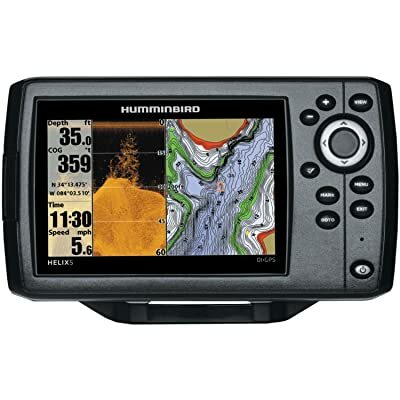 The Humminbird 409590-1 comes with a 5-inch display, including a TFT wide screen LCD monitor. Resolution is another key aspect, when choosing a fish finder. If the resolution is poor, then it will be hard to identify the items displayed on the screen. The resolution on this device is 480v x 800h, producing 256 colors of display. It has a capability of 1500 feet beneath water. This makes it suitable for both fishing in shallow and deep waters. Similar to other devices in the Helix series, this one also comes with split screen functionality. This means that you can use the screen for different things at the same time. Both sides of the screen can work with different zoom levels, thus expanding its capabilities. It also features SwitchFire technology, which is a combination of two great features. The first feature is the Clear mode, which allows you to easily see through rough water. This feature can also reduce and isolate noise produced in shallow water, to produce a clear image. This helps you to eliminate unnecessary clutter. The second feature is the Max mode, which gives you the ability to view what is happening directly beneath your vessel. Fish, bait, objects and structures, can be distinguished easily with the help of these technologies. The quality, the durability and the effectiveness of this fish finder, makes it worth buying. More so, if you are on a tight budget. The Humminbird Helix 7 is a powerful imaging unit, and one of the most advanced on the market. It comes with amazing abilities and features, acting as your sole eye in the underwater world. If fishing is more of a profession than a past time activity to you, then this is the perfect fish finder for you. Notable specs include down imaging sonar, powerful display, dual beam sonar plus, as well as GPS technology. Such features are only found on high-end finders, which cost much more than this device. The down imaging sonar enables you to see everything happening beneath your boat. It is more of a fish eye’s view of what is under your boat. You can therefore see rock, lure, fish as well as other structures that might be under your boat. When it comes to display, it has one of the best. It comes with a 7-inch display that produces an 800*400 resolution. The screen also has high brightness, allowing you to see the readings even during high sunlight. This one also contains a microSD, which can be used to update the software used on the device. What about the dual beam sonar plus? Well, this feature allows you to cover a wide or narrow area easily. The larger beam allows you to scan a wide area while the narrow beam allows you to scan a smaller area, at a higher accuracy. Its GPS feature makes navigation a lot easier. It can be used on both freshwater and saltwater. The Garmin Striker Plus 5cv is one of the best fish finders for lakes. It’s also one of the most advanced fish finders on the market. 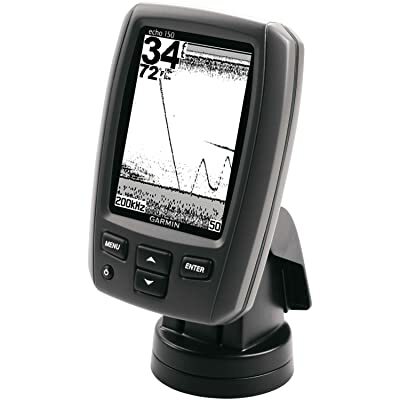 This fishfinder comes with a wide range of features, designed to help you catch more fish. One of its standout features is the integrated GPS system. As much as the primary role of a fish finder is to scan and display information about a particular fishing spot, there is a high chance that you will use this data together with geographical information to maximize the potential of catching more fish. With the Garmin Striker Plus 5cv, you can do exactly that. You can use its inbuilt GPS tracker to identify and mark potential fishing spots using the waypoint feature. After that, you can come back to these spots again using the navigation feature. This Garmin fish finder also comes with CHIRP technology, renowned for providing clearer and more detailed images, compared to traditional sonar units. Instead of using a single frequency like the traditional units, it emits a range of sweeping frequencies, which scan the entire area. Therefore, it will identify more objects, which are underwater while providing greater target separation. Thanks to this technology, it will be easier to separate fish from other objects. Also, it helps you to distinguish between the different types of fish in the area. Apart from CHIRP technology and a GPS device, this fish finder equipped with ClearVu sonar technology, which enables the angler to see photographic quality images of the area you are scanning. Using such high-quality images, it’s easy to identify the areas that will deliver a bigger catch. The Garmin Striker Plus 5cv is definitely one of the best fish finders for your money. It’s easy to use and efficient. Besides that, it’s versatile enough, making it suitable for use in different conditions and areas. It’s also equipped with a wide range of advanced technologies, designed to make your work easier when you are there fishing. With so many GPS enabled fish finders on the market today, it can be hard to choose the best one for your needs. However, the Humminbird 409600-1 is one of the few to combine affordability, accuracy and durability. It comes with a 5-inch display, which allows you to view a large amount of data on your screen, as you choose the most appropriate fishing grounds. This one is easy to install, nothing close to Chinese alphabets. It features a 800H x 480V 256 color display, which also includes a backlighting, making it suitable for day and night fishing. Apart from that, there is also a powerful Side Imaging feature, which allows you to view everything that is happening under your fishing boat, from rocks, fish, weeds and other structures. This one is also compatible with Lake Master, Navionics, AutoChart and HotMaps. This guarantees you a wider area coverage. With the SwitchFire sonar, you can adjust the screen and decide the amount of clutter or level of detail that you want to appear. This Humminbird also comes with a microcardSD, which allows you to track and save fishing locations, which you can visit later. For the price it’s being offered and a long battery life of up to16 hours, this is an excellent device. For many years, Raymarine has been a reliable source for saltwater-oriented sonar equipment and fish finders. However, the Dragonfly series changed all that, and the company has now ventured into the freshwater market. It is one of the newest finders with GPS, DownVision technology and CHIRP. Launched in 2015, this device is one of the cheapest CHIRP devices available on the market currently. 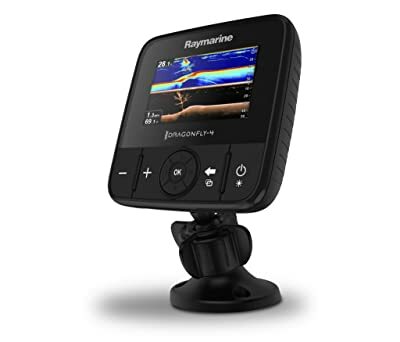 Apart from its crisp-clear imaging, depth capability and accuracy, it also comes with a wide array of features to make your fishing trip productive and successful. DownVision is a great feature on its own. When it is combined with CHIRP capability, you end up with a serious device on your hands, at an affordable price. Talking about its ease of use, well, it comes with only 3 buttons together with a middle dial and a joystick depending on the model. If you are not a tech savvy angler, then you should figure your way around easily. All you want is a device that can help you catch more fish, not try to map out the entire Black Sea. You are an angler, not a cartographer! The optically bonded display is one of the reasons why this device looks so sweet. With the bonded display, light comes out easily while allowing you to view images at all angles. The integrated Wi-Fi is also a nice touch, enhancing the ease of use and the flexibility of this device. Whether you are a professional angler or you just enjoy spending your weekends on the water chasing catfish, the Dragonfly-4 Pro Sonar is guaranteed to change your game completely. The Garmin Striker 7sv is one of the best fish finders for bass fishing. It features a rugged design, which means you can use it even when the conditions are harsh. Regardless of where your fishing expedition takes you, this fish finder will always give you accurate and correct readings. Similar to other fish finders from Garmin, it features a high-sensitivity GPS, which enables you to every fishing location that you intend to return to. The GPS device also enables you to mark your speed, which means that you can quietly approach a fishing location without startling the fish. One of the best features of this depth finder for kayaks and canoes is the waypoint map. It enables anglers to view their surrounding areas whenever they are fishing. Therefore, you can easily mark some landmarks or even navigate to certain spots where you can find a large haul of fish. The waypoint map also enables you to identify stumps, docks as well as brush piles. If you normally fish in different water bodies, then this feature will come in handy. This Garmin fish finder for ice fishing also comes with CHIRP sonar technology, which makes it easy to identify the precise locations where the fish are hiding. Unlike a traditional sonar unit that only sends a single frequency, CHIRP sonar emits a wide range of frequencies, which helps to differentiate between fish and the other objects under water. And with a 7-inch clear display, you will never struggle to read the information displayed on the screen. In the game of fishing, there is a wide range of cool gadgets, products and tools. The industry has fully embraced technology making fishing much easier and enabling anglers to catch more fish. Whistles and bells have replaced that notion of, “that spot looks good.” However, one tool stands out among all of them, is the fish finder. It leads the way when it comes to definite angler advantage and functionality. Without one, you will be relying on the advice of relatives, friends, and other unreliable sources, to identify potential fishing spots. Worse still, you will be relying on chance, hoping that the spot you have cast your line is the chosen one. With a powerful locator device in your posession, you have an invaluable resource that can create all the difference between that invaluable trophy and coming home empty-handed. This is a sonar instrument designed for the sole purpose of detecting fish in water. It achieves this purpose by detected reflected signals of sound energy. All electronic signals reflected off the fish, are then converted into information. This information is displayed via graphic rendition on its screen. Apart from locating fish, these devices allow an angler to measure water depth, water temperature, locate underwater debris and the view the bottom structure. Moreover, you can use finders to mark product waypoints, which adds to the overall safety of your fishing expedition using GPS technology. Thanks to this wonderful technology, it is now more easy than ever to find some good fish! It’s possible to get a good catch without electronics as well, but why hold yourself back, you know what I’m saying? Despite the fact that a good finder device can really help you out, it never hurts to know more about manually finding fish. It is especially helpful for newbies, noobs and nubcakes to learn how to find fish, before relying entirely on an automated device. And besides… you are still going to have to learn how to read that nifty device of yours. Can’t expect automation to automate your understanding. But without further ado… let’s continue talking about fish finders! Which is the Best Fish Finder? How do you choose a good fish finder? With so many models and brands available today, it can be quite hard to isolate one and say it is the best of all. The best fish locator device should meet your individual fishing style as well as fishing needs. Moreover, you can easily get lost in the world of sonar, transom units, flashes, and transducers. Therefore, the most important question to ask yourself, is whether it will help you to catch more fish. After all, that is your goal as an angler. Regardless of how technically advanced a device is, if it does not enhance and improve the productivity of your fishing, then it is not worth your time and money. To make your work a lot easier, this buying guide will provide you with all the information you need, to help you make the best choice. This is the main part of a fish finder. It sends sound waves thus allowing you to see what is beneath the water surface. A transducer sends a sonar signal into the water. The signal is then reflected back by the objects that are underwater. The transducer then receives the signal and converts it into a picture. When assessing transducers, the most important aspect to consider is the cone angle. In simple terms, the cone refers to the extent or diameter of a beam sent from the bottom of the boat. It is narrow when it leaves the boat but gets wider as it hits the bottom of the water body. If you are looking for a bigger viewing perspective, then you should chose a bigger cone degree. With a wider beam, you get more coverage of the target area, which gives you the ability to locate more fish. The main setback of a wider beam is the loss of strength. This means that it doesn’t have great penetrating power, as compared to the narrow beam. Apart from that, it does not provide as clear details as the narrow beam. On the other hand, the narrow beam covers a small extent. However, it can penetrate disturbed or murky waters and still provide accurate details on the structure of the bottom. To enjoy the best of both worlds, look for transducers with dual beam sonar. They are also known as dual frequency transducers combining both features into one device. Some transducers tend to be more specialized. Some can have as many as 4 different beams or even more. These provide more options and can cover a wider water extent while scouring a lake or other water body for fish. Some brands are sold with these accessories while others need an upgrade. One other option is the Side Beam feature, which will be discussed in detail below. Also known as side scan, this is a revolutionary design that allows you to see what is happening on the side of your fishing boat. It provides a bird’s eye view of all the details on your screen. These picture-like, amazingly clear images, will provide every detail on either side of your fishing vessel as far as 240 feet. It saves you a significant amount of energy, when would have been spent when using a regular downward transducer. This feature penetrates murky waters easily, showing you humps, rock piles and even schools of fish that couldn’t have known they were there, if you were relying on conventional fishing methods. If you are a serious fisherman or a tournament angler, a side scan is an absolute luxury that can significantly increase your catch quota. The display is mainly determined by the pixels. If your display has more pixels, then you will be able to see greater object details. It is therefore an important feature to consider. However, fish finders that have higher pixels tend to be more expensive. A fish detector with a minimum of 240(v) x 160(h) pixels would be perfect for both beginners and professional anglers. However, the image will appear blocky in this resolution. If you want a better resolution and a sharper image, then you should be ready to invest more. High definition (HD) screens are among the latest market additions. These realistic devices offer almost the same quality as your HDTV at home, giving you some of the highest realism and best quality available. You will be looking at maps that almost look like real ones. As for the fish, well, you will be able to differentiate them in sizes, and to some extent the variety. Of course, fish finders with HD-enabled screens come at a higher price tag. Fish finders with black and white displays are also available on the market. They are much cheaper. However, it is more preferable to choose devices with color. Color provides enhanced screen definition, making fish to ‘pop out’ in different hues. This makes interpretation and identification much easier. Color screens also tend to be more visible in bright light. Additionally, viewing them under cloudy or dark conditions makes them produce a brilliant view. However, that is not to mean that black and white is useless. If you are tight on budget, just go ahead and purchase, and they will serve the purpose to a certain extent. They are better off than nothing. Screen size is another aspect that comes to mind, when looking at the display. Lower-end and cheaper models generally have smaller screens. This is perfect if you intend to use it as a backup or a secondary device. However, for your main device, go for the largest screen size that you can afford. Don’t, compromise on this. After all, you are buying a fish finder to help you catch more fish. A bigger screen gives you greater viewing surface, which means that you will be able to identify and isolate the fish from other structures beneath the water. A bigger screen also offers better quality. A 5-inch screen is an ideal starting point. This is another essential feature to consider when buying a fish detector. Power of sonar units is measured in watts. A device with higher wattage is more powerful and efficient. It also has better display speeds and more usable depth. On the other hand, devices with low wattage produce slow readouts. This means that it will take a longer period to receive the readouts of a spot you have just travelled over. Therefore, if you intend to go fishing in deep waters such as the Great Lakes or in various saltwater bodies, then you should buy a more powerful unit. If you are a beginner, a 600-watt fish finder will be perfect for you, as you hone your skills in shallow waters. Serious anglers who are planning on going far and deep, need to look for a device with 1000 watts or more. And in this case, also be sure to bring waterproof pants and a waterproof jacket. Those big catches aren’t letting themselves reeled aboard easily, if you catch my drift. You can choose either a portable or entirely self-contained unit or a fixed fish detector that you have to mount on your fishing vessel. If you usually rent boats, go ice-fishing of fly-fishing retreats, then you should consider the portable option. These can be used in various situations, are compact in size, and even come with a carrying case thus making travelling a breeze. Apart from that, they have in-built batteries, which are rechargeable. In the portable units, the transducer is already attached to the transom using a suction cup. Portable fish detectors perform the same way as their fixed counterparts with portability being the only difference. On the other hand, fixed fish finders are preferred by the watercraft owners and settled anglers. You can fix the device on any location on your boat. They can be mounted on the trolling motor, the hull or the stern. Any experienced fisher knows that a GPS is a must have. GPS uses satellites positioned in the sky to identify your precise location. With this feature, you can mark product spots then come back later, once you have exhausted the other locations. It also helps in finding your way home easily, especially if you happen to be fishing on unknown territory. Most GPS-enabled detectors are combo units. This means that they have both a chartplotter and a depth sounder. Chartplotter shows your exact location, superimposed on a map. With this feature, you can always pinpoint your exact location. A GPS-enabled fish finder also allows you to enter waypoints easily. You can use waypoints to mark all fish locations. If you are into big-water fishing, then you should have a GPS-enabled device. It will open up a completely new world of fishing opportunities and fun. It is clear that devices for location fish, are great additions to your fishing gear. With one of these, you are guaranteed higher catch rates in the fishing world. A large catch is what everyone desires, strives and looks forward to, whenever you go fishing. Happy fishing! 2.1 What is a Fish Finder? 2.2 Which is the Best Fish Finder? This page was last updated on February 25, 2019 . Hi Brian, I’m using Humminbird Helix 7. i can recommend it to professional fishermen. Thanks for the tip. I’m sure my readers will appreciate it!